Can your organization react to customer events as they occur? Can your organization detect anomalies before they cause problems? Can your organization process streaming data in real time? Real time and event-driven architectures are emerging as key components in developing streaming applications. Nearly half of organizations consider it essential to process event data within seconds of its occurrence. Yet less than one third are satisfied with their ability to do so today. 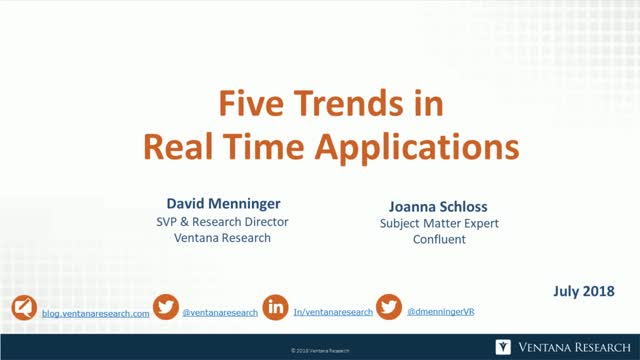 In this webinar featuring Dave Menninger of Ventana Research, learn from the firm’s benchmark research about what streaming data is and why it is important. Joanna Schloss also joins to discuss how event-streaming platforms deliver real time actionability on data as it arrives into the business. Join us to hear how other organizations are managing streaming data and how you can adopt and deploy real time processing capabilities.